A strong ending is a key part of creative writing! Have your second graders flex their fiction comprehension muscles with this activity. Students will consider problem, solution, characters, and detail as they answer questions after reading a short story. It's time to put on your creative writing caps! 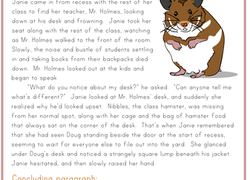 Your students will enjoy writing their own endings to this unfinished story! Get into the story and decide what happens next. How's it going to end? That's upto your fourth grader!